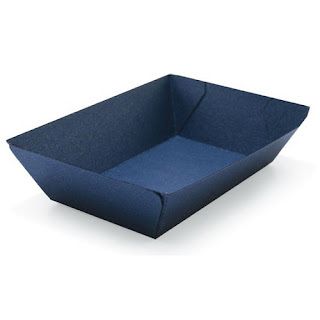 I immediately fell in love with these little paper food trays from Lifestyle Crafts. I had visions of tea parties with my girlies and with her American Girl Dolls. and then the Valentine bug bit me again! 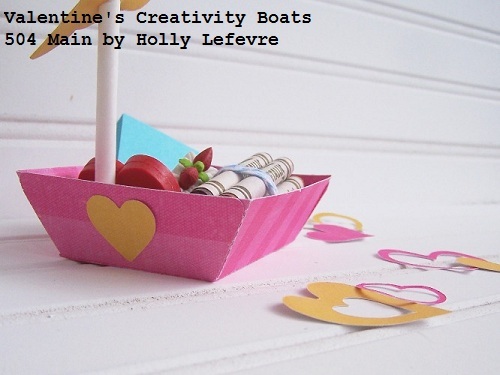 So, I made a little boat - the perfect vessel for filling with Valentines treats! but I chose to go with a non-candy theme for this project. 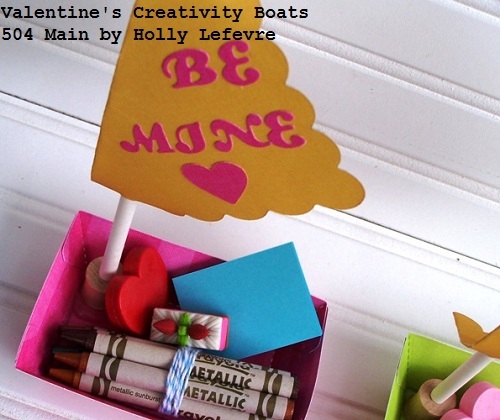 I was inspired but what my little girlie loves - to be creative. and some dessert inspired erasers (sweet!)! in fact next week, you will see how I use them on our picnic! 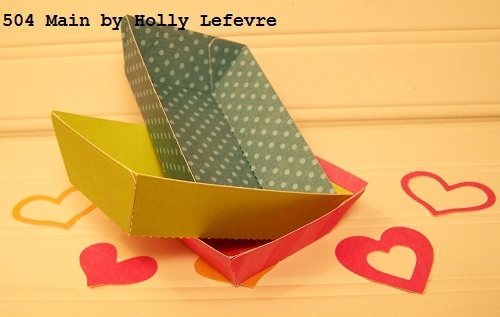 Here's how to make these little boats. and you can achieve this look with other items you may already have on hand. Sturdy Paper sch as cardstock or scrapbook paper. Double sided paper work well because you will see both side of the paper. 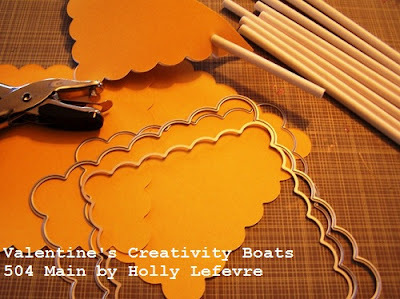 Glue/Adhesive: I used a glue stick, hot glue, and spray adhesive. 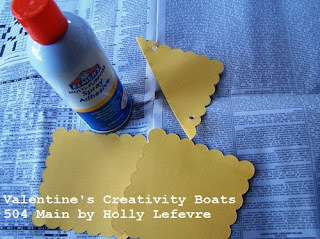 I have these things on hand...you can do this project with less variety of adhesives. I do recommend hot glue for sticking the "mast" down. Optional: ribbon or pom pom for top of "mast"
Using the die cutter, cut out the food tray, letters, and hearts. I cut two food trays for each boat because I did not buy double-sided paper and I wanted the inside and outside of my boat to look the same. They I used spray adhesive to glue them together. 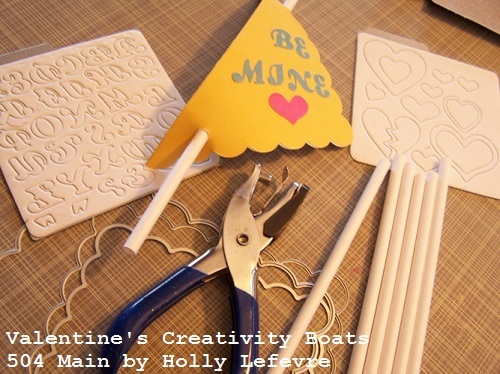 Assemble the food tray: bend along dotted lines; fold sides up; fold in the tabs; and using a bit of glue finish off the tray by gluing the tabs to the inside of the boat. Cute one scallop square for each sail in a desired color. Fold in half, matching the scallops. Cover your work area (for spray adhesive it is best to work outside) with newspaper. Unfold the square, and using spray adhesive spray the inside of the square and then press back together. Use a hole punch and punch one hold on each end of the square, near the folded edge. 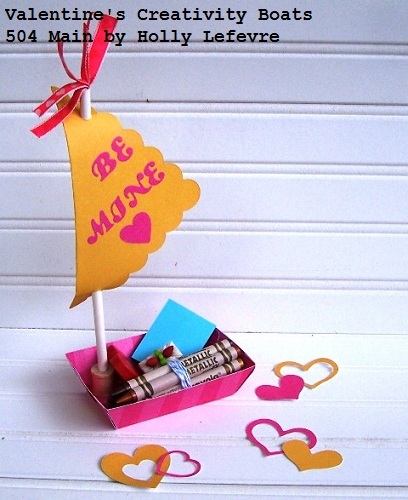 Using the adhesive of your choice (I used spray adhesive), place letters and heart/decorations on the sail. Insert the straw into the bottom hole (from the top) and then back through the top (from the bottom). 3 - Cut a small Styrofoam ball in half; insert the bottom of the straw into it, and glue the half ball int the tray. OPTIONAL: you can glue a pom pom or add some ribbon to the top of the straw/mast for decoration. I just stuck a few short length of ribbon into he top of the straw. I also added a little heart n the back, just for fun. Of course you can embellish it any way you want! 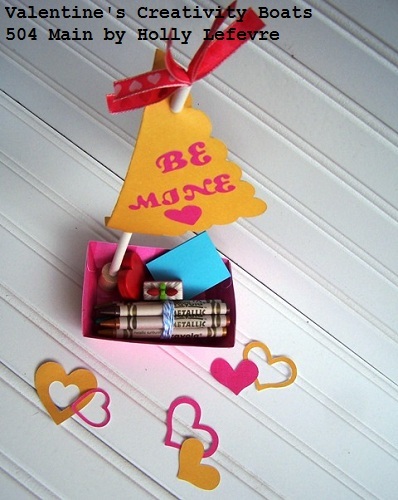 Then...fill it up with whatever you want to give your Valentine! disclosure: I am an affiliate of Lifestyle Crafts. Some dies and products have been provided to me. So cute!!! The colors look beautiful. 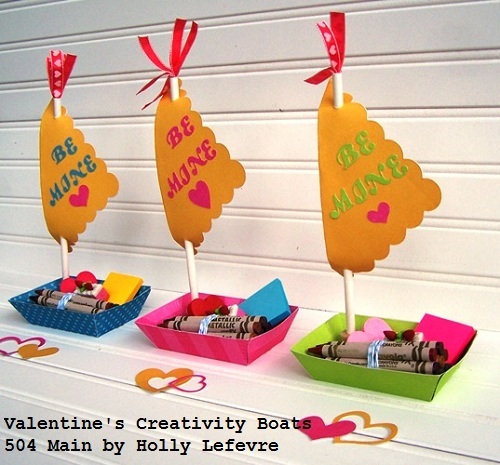 Holly, these little boats are really creative. What a great job you did making them and how imaginative to think of putting in them the items you chose! You are so smart. These are simply adorable and so unique - I love them! Thanks for linking up to Family Fun Friday!